Batman Begins marks its 10th-anniversary this year, and NECA commemorates the occasion with an impressive new 1/4-scale action figure based on Christian Bale's portrayal of the Dark Knight. 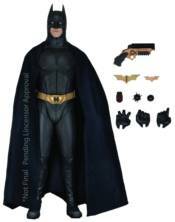 Batman stands over 18' tall and features an authorized likeness, a soft fabric cape and movie-accurate detail (like the hidden compartment in his boot heel that stores a sonar signaling device). The figure is loaded with accessories, including grapnel gun, large hinged Batarang, small Batarang, open and closed mines, sonar communicator and two pairs of hands. Window box packaging.